(Scott Sommerdorf | The Salt Lake Tribune) Utah Republican Party Central Committee members vote overwhelmingly to adjourn a meeting that got off to a rocky start, and never got to the ongoing lawsuit against SB54, which was the main issue as the Utah Republican Party Central Committee met, Saturday, September 9, 2017. 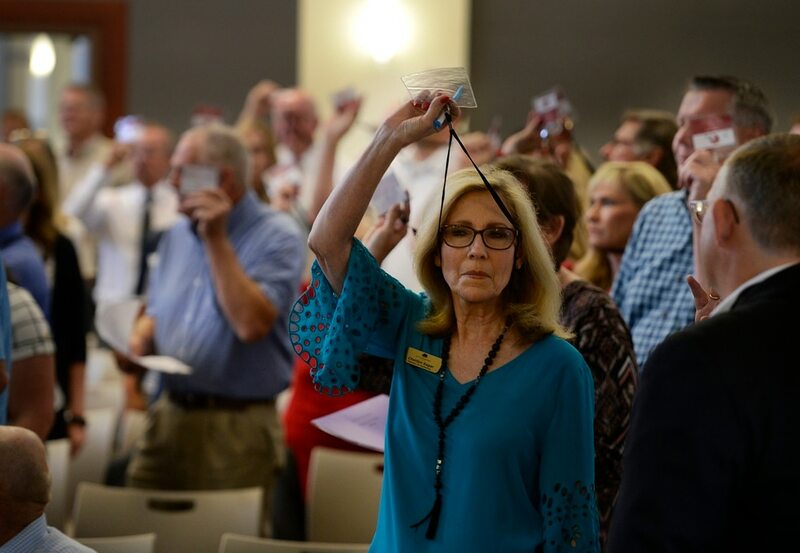 (Scott Sommerdorf | The Salt Lake Tribune) Utah Republican Party Central Committee members Dana Goff, left, helped George Edwards with the light atop his tinfoil hat during a 90 minute debate over what form of voting should be used at the beginning of the Utah Republican Party Central Committee meeting, Saturday, September 9, 2017. Members were split between electronic voting, and old fashioned paper ballots. Voting using paper ballots won out after a demonstration of the electronic voting system failed. (Scott Sommerdorf | The Salt Lake Tribune) Daryl Acumen speaks against continuing the lawsuit against SB54 as the Utah Republican Party Central Committee met, Saturday, September 9, 2017. (Scott Sommerdorf | The Salt Lake Tribune) A man celebrates after getting a tinfoil hat during a 90 minute debate over what form of voting should be used at the beginning of the Utah Republican Party Central Committee meeting, Saturday, September 9, 2017. Members were split between electronic voting, and old fashioned paper ballots. Voting using paper ballots won out after a demonstration of the electronic voting system failed. (Scott Sommerdorf | The Salt Lake Tribune) Utah Republican Party chairman Rob Anderson speaks to the membership about his stance on the ongoing lawsuit against SB54 as the Utah Republican Party Central Committee meeting, Saturday, September 9, 2017. Moderate and right-wing factions of the Utah Republican Party battled Saturday over whether to continue appealing an expensive, divisive lawsuit challenging the state’s new election law — leaving the new chairman caught in the middle amid threats that some would pursue his removal should he opt to drop the suit. But after six hours, the 180-member State Central Committee opted to adjourn before any direct vote on the matter. Conservatives declared that a victory, saying it means the party must uphold a previous resolution that ordered ongoing appeals that challenge the new law, SB54, which allows candidates to qualify for a primary election by collecting signatures and/or the traditional caucus-convention system. Moderates disagree, arguing that new party chairman Rob Anderson has power to end the lawsuit if he chooses. They say the central committee failed to give him clear direction by evading a vote, so whether to proceed is up to Anderson alone. Anderson — who pleaded to end the lawsuit because it helped put the party in heavy debt, has led to divisions and chased away many donors — said he didn’t know what he will do. “I’ll have to strategize,” he said after finding himself between the warring factions. Meanwhile, Rich McKeown, co-executive director of Count My Vote, said the GOP’s battles and murky position give his group even more reason to relaunch an effort to gather signatures for a ballot initiative to completely replace the caucus-convention system with an open primary. “To me, it’s really just status quo,” McKeown said about GOP actions on Saturday. “Over the course of time, we’ve had to deal with uncertainty from forces that want to do away with this dual system. That’s what makes us talk and contemplate moving forward” with the ballot initiative to cement an open primary into law. In 2014, when it appeared that Count My Vote would likely qualify for the ballot and polls showed that voters favored replacing the caucus-convention system with an open primary, legislators passed SB54 as a compromise to allow both systems. The Utah Republican Party later said it had never signed off on the compromise and sued GOP officeholders to challenge SB54 in court. It lost lower court decisions, but the 10th Circuit Court of Appeals in Denver is scheduled to hear oral arguments on the party’s appeal on Sept. 25. The lawsuit has caused party divisions. Business executives, for example, say convention delegates tend to pick nominees far more to the political right than the general electorate — and favor SB54 as a way to advance candidates who are more representative. Anderson said those executives and their companies quit donating to the party, worrying money would go only to the lawsuit, which helped create heavy debt. But the right wing of they party dislikes SB54 because it weakens the power of convention delegates. For example, convention delegates recently nominated ultraconservative former state Rep. Chris Herrod in the special election in the 3rd District congressional race — but he lost in the primary to more moderate Provo Mayor John Curtis, who qualified for the primary by gathering signatures. “The lawsuit needs to end today,” Anderson said, although he’s undecided whether to do that without more support. He noted the party has spent $300,000 on the suit so far, although recent fundraising has helped resolved some of the financial strain that once included $100,000 in operating debt, as well. Even if it won appeals at the 10th Circuit, he said years more of expensive legal battles are likely. He said it chases away donors and diverts the party from its main job of electing Republicans. He said the best way to preserve the caucus-convention system is to change the battlefield from the courts to the Legislature and with voters themselves. “We’ve lost the voters” because of what he says have been unanswered arguments made by Count My Vote. Anderson argues the party would be wiser spending its money to show them the benefits of a caucus-convention system. 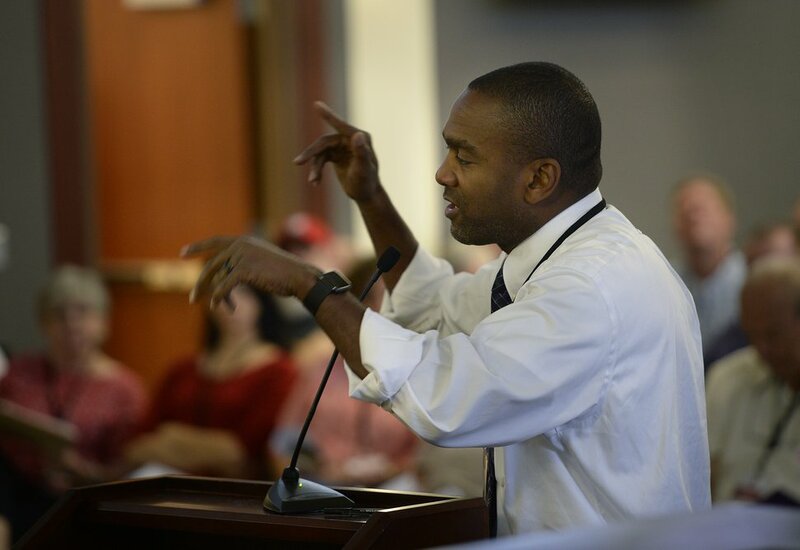 (Scott Sommerdorf | The Salt Lake Tribune) Daryl Acumen speaks against continuing the lawsuit against SB54 as the Utah Republican Party Central Committee met, Saturday, September 9, 2017. Daryl Acumen, the delegate who proposed a resolution to drop the lawsuit, argued that doing so would help stop Count My Vote from relaunching its initiative to kill the caucus-convention system entirely. Delegate Don Guymon, who pushed a resolution to again call for the party to continue its legal challenges, argued that Anderson is bound by previous resolutions taking that same position — and could be booted out of office if he tries to do otherwise. (Scott Sommerdorf | The Salt Lake Tribune) Utah Republican Party Central Committee members Dana Goff, left, helped George Edwards with the light atop his tinfoil hat during a 90 minute debate over what form of voting should be used at the beginning of the Utah Republican Party Central Committee meeting, Saturday, September 9, 2017. Members were split between electronic voting, and old fashioned paper ballots. Voting using paper ballots won out after a demonstration of the electronic voting system failed. While the SB54 resolutions were the main attraction Saturday, little debate on them actually occurred amid plenty of delays that had the effect of ultimately blocking such discussion, perhaps by design. That came as the central committee held elections for several party committees and positions. The party had intended to use electronic voting with members’ smartphones and computers, but conservatives delayed that for more than an hour complaining they had doubts about its security and whether their votes would actually be counted. 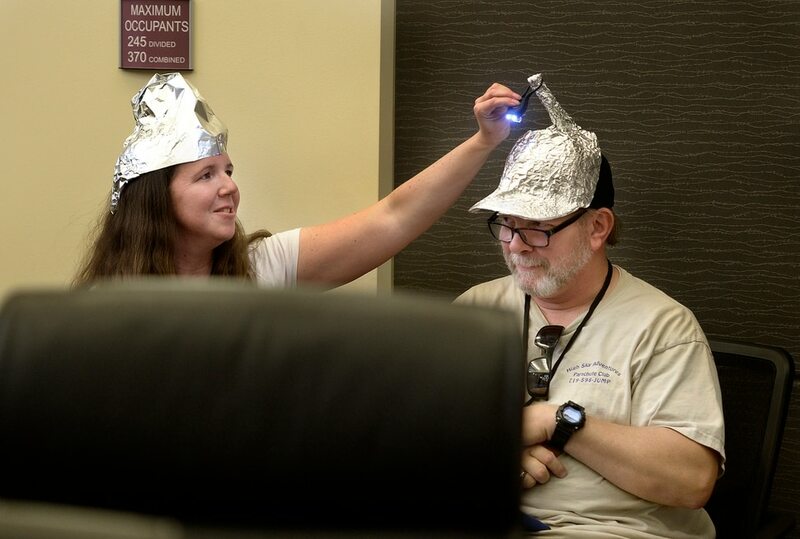 Many delegates jokingly wore tin-foil hats to stop any reading of their minds. Some moderates joked it was a good allegory about the fear of changing how primary elections are conducted, too. After long discussion, the committee attempted to proceed with electronic voting. But the system crashed. Anderson said later that a member of the committee “actually was successful in targeting the Wi-Fi and taking down electronic voting to delay that. We figured out who that is, and will take steps” to punish that person. With the problems, the committee reverted to paper ballots — which took time to distribute and cast. When the committee attempted to start debate on the SB54 resolutions during the count of the votes, some delegates successfully protested and persuaded members to vote to delay debate so those counting the votes could participate in it after the counting was done. In the end, Acumen was the only delegate to actually speak on the issue when he introduced his resolution. Guymon offered his resolution as an alternative, and it was read — but debate was then cut off to wait for results of officer voting. Much later — after many delegates had left and others worried about leaving in time for festivities around the BYU-Utah football game — conservatives called for a vote to adjourn and prevailed.